The Drunken Housewife: Is One Death More Important Than Another? If you read my blog, you will know that I never write about current events or pop culture. I don't watch much TV or read magazines. I don't get worked up about the lives of celebrities. I don't know what goes on in Hollywood and I really don't care. The world knows that Whitney Houston died over the weekend and even though it didn't happen in Bikini Bottom, even I heard about it. I'm sorry. 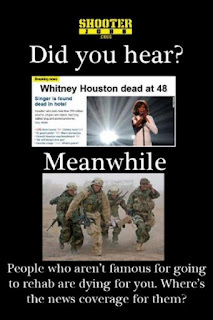 I am not a die hard fan of Whitney. I didn't cry, won't be attending a memorial service, won't be playing her music any more than I did before or joining a Facebook page dedicated to her memory. I am, however, bothered by these pictures I see making the rounds on Facebook. I understand the sentiment. As Americans, we seem to care more about frivolous things than we do things that really matter. 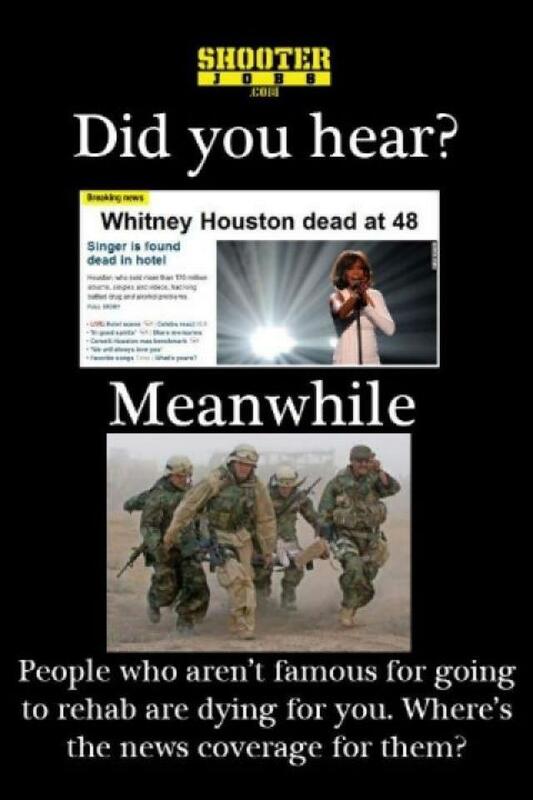 Celebrities seem to take precedence over serious problems. I agree. I also find it ridiculous, but is this really the best way of making that point? Taking one tragic event and playing it against another makes no sense. I can do that all day long. All over this country, children are beaten, neglected, starved, uneducated and die. How would people react if I posted a picture of one of these children against men on a battlefield with the caption that the child didn't enlist in poverty? It would piss people off. My point? Death is tragic. It doesn't matter who you are or how you die. Human life is precious. Whitney Houston was a mother, a daughter, a friend and so much more to many people other than her fans. It shouldn't matter if she went to rehab or had a troubled life. I'm sure there are men and women on a battlefield somewhere who can relate. Celebrities are celebrities because we (the ordinary people) make them that way. If you have a problem with this, stop watching TV, seeing movies, buying magazines and downloading music. If you really need to make the point that people don't care about real issues, I'm sure you won't have to search long to find something really ridiculous. Lindsey Lohan put her belongings in storage and the movers are trying to sell pictures. I'm sure someone wore an awful dress to the Grammy's last night. Did Katy Perry bash Russell Brand during her performance? I could go on, but I think I've wasted enough of my time looking up celebrity trash. Great point! I agree with you. Well said. Thank you Nicole. I'm surprised that nobody has said anything mean. I was kind of expecting it! I agree with you that death is tragic no matter who the person is... but I do understand the point the pictures are trying to make.. I saw it posted on facebook from a very good friend who is a veteran. 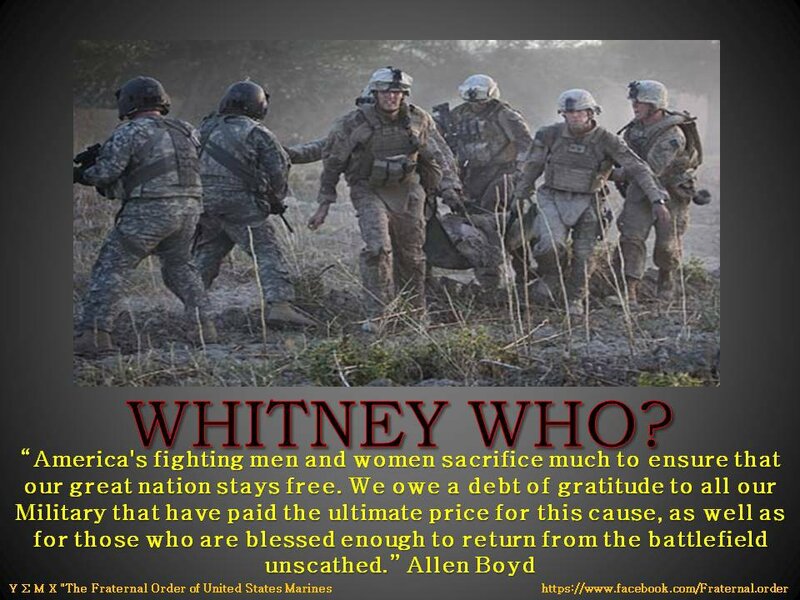 They put their lives out there for us, for our freedom and our country knowing they might lose their life at any given moment. I am not being mean at all, but I think its sad when a soldier gets a 20 second clip on the nightly news IF they are from the area, but we have no choice but to hear about Whitney's death on every news segment since her death. I sort of agree... People are always affected by a death in the family...and whitney has one too.i feel Sorry for her daughter who has been in the news for being upset... No privacy at all!! Soldiers die every day without warning... They deserve more than what they get.